There are a lot of ways to describe going paperless: document management system, electronic document management, electronic content management, file storage, document imaging, records management, etc. Whatever term you choose, it all adds up to the same thing - making your workplace paperless. By removing annoying daily tasks such as chasing documents just to get your job done, you quickly realize how paper bottlenecks have held you back. Going paperless increases productivity by 90% or more and changes the way you feel about the workplace. 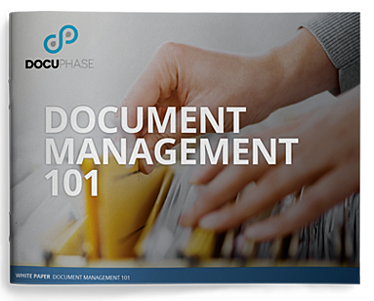 Download your free copy of this white paper now to start learning about how Document Management can help you.